Before I could even set up, Hercules came in from the southeast with an oriole. As soon as her talons touched the nesting ledge, I heard Max screeching behind me and looked up. 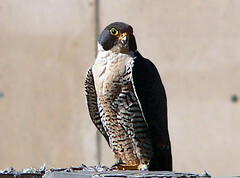 He careened down from the skyperch, vocalizing the whole way, before landing next to her on the nest ledge. Herc dropped the oriole. Max waddled over to her, picked it up and disappeared into the nest. Herc watched the activity in the nest for a moment and then took off again, heading southeast. Five minutes later, Max came out of the nest and went directly back to the skyperch. Babies fed, wife hunting, time for Max to put his talons up and watch the game…ok, maybe not that last part. Twenty minutes later, Herc came back from the southeast with a vividly blue-breasted bird with black legs. Again, Max noisily descended from the skyperch and took the bird from Herc to take into the nest. Herc watched, then flew off to the east. Max came out of the nest five minutes later and flew to the southeast. Herc came back 18 minutes later, landed on the westernmost niche (about six to the left of the nest), vocalized while looking inside then hopped down there. After five minutes, she came back out and flew to the east. After some consideration of this behavior, either the chicks have access to the entire length of the building from access areas connecting the ducts or Max and Herc have cached food in most of the niches. It’d be very interesting to get a good, long look into the niches to solve that mystery. Max came back from the south with a Mourning Dove, which he took to the nest. After coming out, he looked to be heading back up to the skyperch, but huzzah! Instead, he landed right next to me on the stairwell roof. LEG BAND! I took my camera out, grabbed the tripod and slowly backed up until I could see his whole body. He watched me curiously. When I was all set up, he promptly sat down on his feet, making viewing his leg bands impossible. Frustrated anthropomorphizing: DANG! It really seems like Max, has got tremendous comic timing and enjoys stringing me along to that last second. I watched like a hawk (har har) for any sign of Max’s leg band, but no luck. He groomed, he slept, he looked around – all the while sitting down on his feet, legs tucked up into his feathers. I heard a falcon cry to the east and both of us turned to watch Hercules come careening in. She flew directly over our heads, vocalizing the whole time. 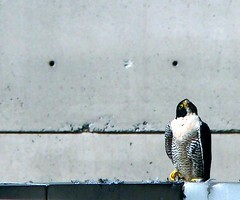 Max watched her and vocalized back before standing up quickly and taking off to join her on the skyperch. ~ by Steph on May 20, 2006.